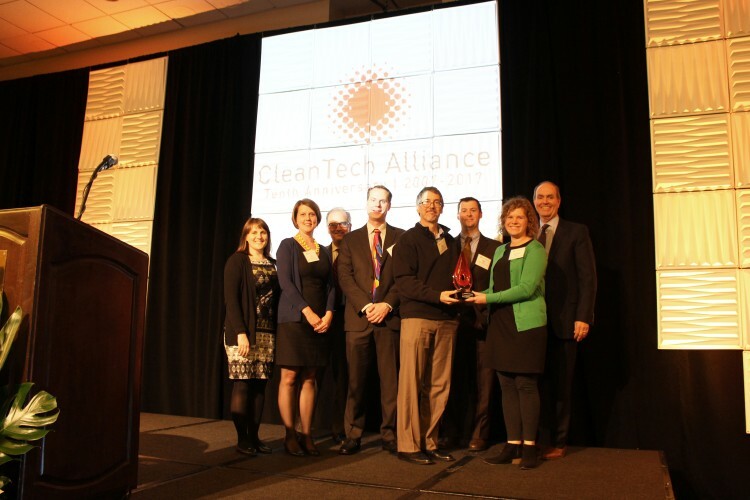 The CleanTech Alliance has presented the University of Washington with the organization’s 2017 CleanTech Achievement Award. The honor recognizes the UW’s dedication to research and development of transformative clean energy technologies, facilities, pipelines for startups and industry partnerships. The CleanTech Alliance has presented two Achievement Awards annually since 2007, one to an organization and the other to an individual. In this year’s organization award, the Alliance cited the UW’s ongoing contributions to clean energy research and discovery across campus; pipelines for commercial development and opportunities for industry partnerships through the Clean Energy Institute and CoMotion; and programs such the Alaska Airlines Environmental Innovation Challenge, now in its 10th year, through the Foster School of Business’s Buerk Center for Entrepreneurship. In the UW’s nomination for the award, supporters and industry partners noted groundbreaking discoveries in cleantech and alternative energy that have come from UW faculty, staff and students in the College of Engineering, the College of Arts & Sciences, the CEI and the Molecular Engineering & Sciences Institute. UW research in these fields ranges from smart grids and innovative energy storage technologies to solar cell materials and ultrathin semiconductors. Achievements in these areas have made the UW a lead recipient of grants and funding for research and innovation. For example, UW is regularly a top 10 university recipient of Science Office funding from the U.S. Department of Energy. The National Science Foundation also recently awarded the university $15.6 million for a Materials Research Science and Engineering Center and $3.8 million to the CEI for DIRECT, a cleantech data science training program. The CleanTech Alliance also lauded the university’s partnerships, innovations and pipeline-building endeavors to move discoveries from the bench to the production line. The CEI, for example, in 2017 opened the Washington Clean Energy Testbeds to provide researchers and industry partners with much-needed proving grounds and scale-up facilities for clean technology manufacturing and research. UW-based research has also led to startups for cleantech enterprises that were launched through CoMotion, the CEI and UW colleges. “The technologies and startups spinning out from the University of Washington get stronger every year and will clearly continue to do so for years to come,” said Ranken.